Three 20-something women trying to figure out what it means to be lay, Catholic, and modern all at once. This month, I'd like to introduce Anna Abrikosova - a Russian Eastern rite Catholic saint who died in the Gulag in 1935. She converted to Catholicism in 1908, at Saint Magdalene’s Church in Paris (A connection to our patroness!!) Her husband converted a year later in Rome. Looking at the people walking about, they suddenly saw walking skeletons with torn clothes instead of real persons. They started thinking of their spiritual life, neglected up to that moment, and they became fervent Catholics. In 1913, Anna entered the Third Order Dominicans and started an apostolate to help young women who were ostracized from their families for embracing the Catholic faith (which, as you may know, is not very popular among the Russians -- who proudly adhere to their Orthodox faith). She and her husband both entered religious life in 1917 when Anna -- now known as 'Mother Yekaterina' (Russian for Catherine after St. Catherine of Sienna) -- began a Dominican community in Moscow. On 11 November 1923 Anna Abrikosova, the sisters and some of the parishioners were arrested. The tribunal sentenced Mother Yekaterina and the oldest sister 10 years in jail, three of the other sisters to from 5 to 8 years in a labour camp, and the others to 3 years’ exile in Siberia. Their time in jail and the camps is an example of pure love and sacrifice for outcasts, petty criminals and syphilitics. 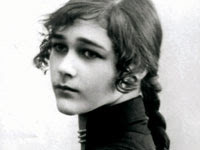 In August 1932 Anna Abrikosova was transferred to the hospital of Butyrka prison and underwent an operation for cancer; after the operation she was confined to Kostroma. One year later, Mother Yekaterina was arrested again and accused of leading a counterrevolutionary terrorist organization plotting to assassinate Stalin. She was condemned to 8 years in jail but her condition deteriorated and on 23 July 1936 she died of cancer in the hospital prison, aged 54. Her death and her witness to the world in a time of darkness is similar to the death and witness of my namesake, Edith Stein. Both of them women of God's fortitude and blazing examples of women warriors! See article here for more information. amazing, Edith. Also, she is gorgeous. 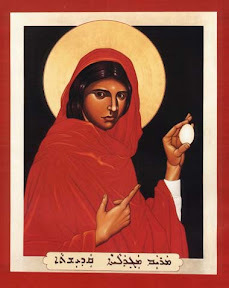 St. Mary Magdalene is one of the most important female disciples of Christ, and the first to witness the resurrection. A faithful servant to Christ, and a reformed sinner, Mary Magdalene is a witness to the power of Christ's mercy. Icon by Br. Robert Lentz, O.F.M. Love has no beginning, since before it became concrete, it was already present in the attitude of readiness. Dear Jesus, I know that every perfect gift and especially that of chastity depends on the power of your Providence. Without you, a mere creature can do nothing. Therefore, I beg you to defend by your grace the chastity and purity of my body and soul. And if I have ever imagined or felt anything that can stain my chastity and purity, blot it out, Supreme Lord of my powers, that I may advance with a pure heart in your love and service, offering myself on the most pure altar of your divinity all the days of my life. Amen. "By living up to their calling, women will succeed in guaranteeing a proper recognition of the unique value of femininity and its crucial mission in the world."